This post is sponsored by Rembrandt, but all enthusiasm is my own. Have I mentioned that I'm an avid coffee drinker? I drink a few cups in the morning to get me going and usually a few cups in the afternoon to keep me going. As an autism mom homeschooling three kids, I need my caffeine. If I'm not drinking water the rest of the day, I'm drinking unsweetened tea. This works well to keep me functioning, but it's not working so well with my teeth. They are stained, and I would love to get a professional whitening treatment. However, there are a few problems with that. First, the cost. Yikes. Secondly, I don't have time. 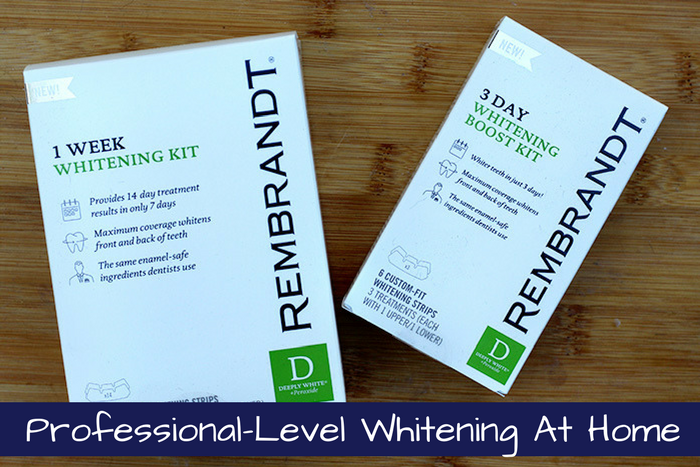 I recently tried the Rembrandt 1 Week Whitening Kit, and I am glad I whitened at home to save time and money, and I still got great results. Rembrandt has several options to whiten your teeth at home, depending on much whitening you need and how quickly you want to get your teeth whiter. They have toothpastes to help whiten your teeth, but these can take a while to see results. For faster results, they have a 1 Week Whitening Kit and a 3 Day Whitening Boost Kit. All of their products have enamel-safe ingredients that dentists use. You can use them at home for professional-level whitening instead of going to the dentist. You'll also see results in about half the time as other at-home whitening kits. Since it has been several years since I've used any kind of whitening, I tried the 1 Week Whitening Kit. My teeth were stained from coffee and general life, so I needed more than the boosting kit. This kit whitens in seven days as much as other kits whiten in 14 days, so it does give quicker results. This kit uses strips that you place on your upper and lower teeth twice a day. I really like the strips versus using a tray because strips are easier to place and more comfortable to use. The strips still whiten the front and back of the teeth, so they work just as well as trays. I can honestly say that I've never tried to photograph my teeth before, and I learned something. I can not smile showing my teeth. I physically can not do it. You learn something new about yourself all the time, right? So excuse how little of my teeth are actually showing. As you can see, I got great results in just one week. I was thrilled that I didn't have to go to a professional because I just don't have time for that right now. When my teeth start to yellow again, I won't wait as long to whiten them now that I know how easy it is to do at home. I'll use the 3 Day Whitening Booster Kit when I need it. It works the same as the 7 day kit with strips. If you're ready for whiter teeth in just one week, check out Rembrandt's line of at-home teeth whitening products.